One garage flooring option that has created quite a buzz in the industry the last few years is polyurea/polyaspartic floor coatings. This relatively new coating has become the latest favorite for installers as an alternative to epoxy. It has created some confusion for home owners as well. The fast curing ability of this system is being billed as the “Holy Grail” of floor coatings and is advertised as the best of everything that a coating can do. So if it’s not an epoxy, what is it exactly and why would you want it on your garage floor? Let’s unravel the confusion about polyurea and polyaspartic floor coatings and see why many garage flooring companies are pushing this new product. Without getting too technical, Polyurea is a subgroup of polyurethane. It is formed when isocyanates react with water or polyetheramines to create a urea linkage. Like epoxy, it is a 2-part component that mixes resin with a catalyst to cause the curing reaction that makes the material hard. It has low to no VOC’s and has an elongation rate that exceeds 300%, making it much more flexible than epoxy. It is commonly used for spray-on bed liners, interior pipe coating, liquid containment lining and many other industrial applications such as tunnel coatings and fillers for joints. Because of its extremely fast cure rate (less than 5 seconds and fully hard in less than 5 minutes), most polyureas require specialized equipment for application. “By definition, a polyaspartic is an aliphatic polyurea because it is the reaction of an aliphatic polyisocyanate with a polyaspartic ester – which is an aliphatic diamine”. What polyaspartics do is conquer the difficulties of the extremely fast cure rate of polyurea in order to apply the coating in a more traditional manner, with a longer pot life of 5 to 120 minutes depending on the formulation. So in essence, all polyaspartics are a polyurea, but not all polyureas are a polyaspartic. So to lessen the confusion, this means that when you see a garage floor coating or kit being advertised as a polyurea, or a polyurea polyaspartic, it is really some formulation of a polyaspartic coating. Now that we’ve covered these eye numbing explanations, what does it mean for you? The two biggest advantages of a polyaspartic or polyurea garage floor coating are temperature and time. Unlike epoxy, a polyaspartic coating can be applied in temperatures as low as -30F to as high as 140F depending on the formulation. That means you don’t have to wait till spring or summer to coat your garage floor if you live in a colder climate. Typical polyurea and polyaspartic floor coatings are applied in just two coats; the first being both the primer and color coat and the second being the clear coat. Because of their fast cure rates, a complete flooring system can be installed in one day and returned to service the next. This means that you won’t have to do without your garage for 3-4 days like you would for a full epoxy system. 100% U.V. stability – they will never yellow. Crystal clear finish that won’t blush from moisture in the concrete. Similar high abrasion and scratch resistance to polyurethane. High tolerance to heat, meaning hot tire pick up is a non-issue. High film build-up that can be controlled by the applicator. High solids content with little to no VOC’s in most applications. High stain and chemical resistance. This includes salts for winter climates. Good flexibility for higher impact resistance. Excellent wetting characteristics allowing for good penetration into the concrete for a strong bond. Decreased chance of bubbles from outgassing due to the faster cure rate. Though a polyaspartic or polyurea flooring system does have some great benefits, there are some other factors to consider before you decide if this is the best system for you. The first is cost. To have it professionally installed will cost an average of $2 to $3 more per square foot than an equivalent epoxy and polyurethane system. It is also not the most user friendly “do it yourself” installation and requires a minimum of two people to apply. Depending on the formulation of the polyaspartic, the average pot life is only 20 to 25 minutes. This can be very intimidating if you haven’t done a floor coating before. Also, the materials alone can cost almost twice as much as epoxy. One thing to keep in mind is that like epoxy, not all polyaspartics are created equal. Some of the DIY kits that are being offered are not of the same quality as the more professional versions. So shop around and compare if you want to install a garage floor coating yourself. The formulations are different and come with a lower solids content in order to lengthen the pot life. Grinding the concrete is also the recommended floor prep. While polyurea / polyaspartic coatings are not affected by water or humidity when fully cured, humidity during installation can cause the coating to cure much more rapidly and should be monitored before installation. There are now newer single-part polyurea garage floor coatings available that are extremely easy to apply. They have and unlimited pot life and excellent protection. Learn about single-part polyurea here. Another consideration is that if you are a regular garage mechanic, polyaspartics don’t stand up as well to battery acids like epoxy and polyurethane does. They also can be very slippery when wet. If you are not applying full paint chips to add texture, it is advisable to add a slip resistant aggregate into the top coat to increase the anti-slip properties of the coating. One of the biggest reasons that professional installers are offering polyaspartic floor coatings is to sell the benefit of being without your garage for only a day. A good installer can prep your concrete and install your coating in as little as 6 – 8 hours. You can be moving your belongings back into the garage before the day is done and park your car in it the next. This can be a huge advantage for people who can’t be without their garage for 3 or 4 days. If you need to have a garage floor coating installed in less than ideal temperatures or need the advantage of being without your garage for only a day, then a professionally installed polyurea or polyaspartic floor coating may be just what you need. It is a great garage flooring option if the cost is in the budget. I am looking to have my garage floor finished. I live in Minnesota. I have talked to two contractors. One has a Polyurea + Chips + Polyurea process where the other has an Epoxy + Chips + two coats of Polyurea top coats. The latter says the epoxy bonds and seals better on concrete as a base coat than Polyurea but adding the two layers of Polyurea topcoat provides the superior protection needed. The cost between the two contractors was not significantly different. With the prep processes being a diamond grind for both, what one would you think would provide the best results over time? Hi Steve. You ask a great question. The latter is the best way to go between the two choices. As stated, epoxy will bond better with the concrete since it takes a little longer to cure. The clear coat is the wear coat. So two coats of polyurea is excellent for a floor with color flakes – particularly if you opt for a full flake floor. I have heard that the polyurea basecoat is better than epoxy. Have I heard incorrectly? How can I get to the bottom of actual facts of an epoxy primer versus a polyurea primer being the better choice? Thanks for your help. Hello CC. Are you asking about base coats (polyurea vs epoxy) or are you asking about the appropriate primers for base coats? These are actually two completely different things. What is it exactly that you want to accomplish? I guess then I’m not sure. I’m being told that a polyurea base coat (then flakes – then polyaspartic top coat) is better than an epoxy base (then flakes – then polyaspartic top coat). But then I read your article that says an epoxy primer, then an epoxy base, then flakes, then polyaspartic top coat is the best. Now I’m confused! I want the top end, high end, best, long lasting, durable solution in my garage (and for that matter then concrete in my basement, also will be doing outside sidewalk/porch and pool deck). This one contractor is telling me polyurea (that they roll and brush on) is best for basecoat. They don’t say anything about primer – just polyurea base, flakes, then polyaspartic top. They also say they won’t offer any kind of epoxy at any level because it is “widely known” that epoxy is inferior and would never have a long warranty (lifetime) against chipping and peeling. Ugh… It’s contractors like these that create confusion when potential customers are trying to figure out what is best for them. It is not “widely known” that any type of epoxy is inferior to polyurea and/or polyaspartic coatings. It is a very ignorant statement or they are just trying to sell you (quite poorly) on the only system of coatings they use. High solids and more commonly, 100% solids epoxy, is widely used in commercial applications for such things as warehouse floors, automotive dealerships, restaurant kitchens, and etc. It is a very high build (thick) coating that provides many performance characteristics depending on how the floor will be used. It is only used indoors (not direct sunlight) due to the fact that it is not U.V. stable. Many concrete coating installers are using polyurea and/or polyaspartic coatings these days because they can get them installed in one day. This saves money on labor and allows them to do more jobs in a given week. Most are good quality coating systems that provides outstanding abrasion and chemical resistance as well as U.V. resistance. They can also be applied outdoors. If they are a reputable contractor with a good warranty, these types of coatings can perform very well, but they are not the best. Ultimately, the top coat is what determines how well a system will wear, resist scratches, and resist staining. Therefore, a hybrid system that consists of an epoxy primer, 100% solids epoxy, full color flakes, and a polyurea or polyaspartic top coat is going to provide better durability and impact resistance because it is much thicker and adheres better to the concrete. It is also U.V. stable since the epoxy is essentially covered by the full color flakes. Epoxy takes longer to cure and as a result, it seeps deeper into the concrete pores to get the best mechanical bite for adhesion. That is where the epoxy primer comes into play. Coatings that cure within a couple hours to bare concrete (polyaspartic) will not get the same adhesion. 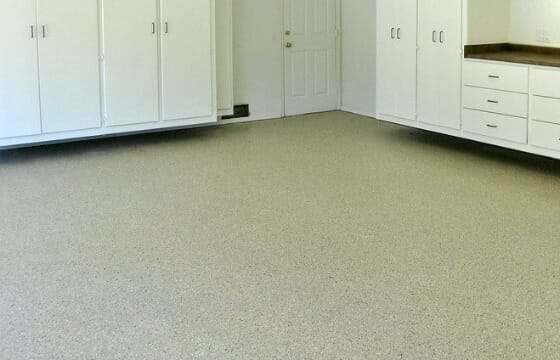 Garage floor coating contractors that offer a variety of products will always quote such a hybrid system as the best. Hybrid systems can be as much a 35-40 mils thick, whereas the standard two coat polyurea polyaspartic floors are 15-20 mils thick. Keep in mind that such a hybrid system can be overkill if all you do is park your cars in the garage and do light maintenance work. Also, always ask to see the data sheets on the product a contractor plans to use as well. This is a way to compare product from one contractor to another. This article here also helps with choosing a floor coating contractor. Hopefully we cleared some things up and didn’t create more confusion for you! Thanks for the detailed response about the hybrid system. You know your stuff, as you are correct: this contractor only provides the one system (polyurea base, flakes, and polyaspartic top). However, they also claimed that epoxy is more susceptible to any moisture that might come up from bottom through concrete (causing bond failure); whereas, polyurea actually welcomes the moisture as a catalyst that helps the curing process. Also, they claimed the polyurea is much more flexible than epoxy, so any shift in concrete from earth movement, moisture expansion, freezing, and just the expanding and contracting of surfaces with temperature changes allow polyurea to hold up with much more flexible properties. They said the epoxy is more brittle; therefore, will develop cracking more easily. I was told expect a 3-5 year life before recoat needed on a 100% solid epoxy base vs likely never needed again with a polyurea base due to superior strength and flexibility. Are they just selling me a bill of goods or what? Yikes… many polyureas are moisture cured. This means that the catalyst for the curing process is moisture in the air – not the ground. The more moisture in the air, the faster they cure and vice versa. If ground moisture is introduced during the curing process the polyurea will react in a negative manner. Special formulations of epoxy are actually used as moisture vapor barrier blockers for concrete – not polyurea. Just do a google search for “concrete coating moisture block” and you will see all the epoxy products and not polyurea. Epoxy bonds better with concrete and is why special blends are used to prevent bond failure in concrete with high moisture content. Yes, polyurea and polyaspartics are more flexible than epoxy (relatively speaking). This flexibility helps to prevent scratches (hard epoxy scratches easier) and is one of the reasons why it makes for such a good top coat. Special blends of polyurea are good to fill contraction joints before a coating is applied as well. However, if your concrete actually develops a serious crack, a polyurea coating is not going to hide it. Epoxy coatings are used all over the world in climates with large temperature swings. We have yet to see an epoxy floor coating that suffered to concrete expansion and contraction. The part of a floor coating that would require a recoat as it wears (if it’s needed) is the TOPCOAT – not the base coat. You would have to wear through the polyurea/polyapartic top coat on a hybrid system in order to get to the 100% solids epoxy base coat to begin with. If you are using the same top coat, how would it be possible for the epoxy base to be exposed and not the polyurea base? What they are stating makes no sense at all. Unfortunately, it sounds like the more they speak the more they reveal their ignorance. They obviously know just enough to tout the benefits of the one polyurea polyaspartic coating system they install without knowing the science behind it and even less about other coatings. How long have they been in business? As I stated, the type of system they install (assuming it’s good product) is a good system, but it’s not the best as they suggest. However, it does quite well for the average residential garage. We have just had a polyurethaning polyaspartic floor professionally installed in our garage last week. The oder is horrific. We now have heaters and fans going. Not much help. Are these fumes toxic? We are in St. Louis, Mo. The temperature has been around 30 degrees. Our installer came with good recommendations. How can we eliminate the smell from these fumes? Thanks. Hello Sandra. It can take longer for the coating to cure in colder temps, but the odor should not last more than a few days. If the odor is still bad we recommend that you contact the installer and have them come and examine the coating. We have found in the past with cold temperatures that sometimes installers can be a bit too anxious and not wait long enough for the first coat to set up and cure before applying the second coat. As a result, solvent fumes from the first coat get trapped and can take a long time to dissipate if at all for quite a while. If this happens, it sometimes requires removal and reapplication of the top coat or even the entire coating to solve the problem. I’m curious about product qualifications, I need a product that has ease of application, versatility with regard to application environment, as well as the ability to conform to industry requisites such as ansi etc. Is there a single part polyurea or polyaspartic product that will fit this criteria? Hi Brian. We suggest contacting both Legacy Industrial and ArmorPoxy and ask them about the ansi specs. They both provide single-part polyureas to commercial floor coating contractors and installers that are required to meet certain specification. In fact, the ArmorPoxy clear single-part polyurea was used inside the main floor of the 9/11 Memorial in New York. Hello Carol. The two coatings are similar, however, polyaspartic coatings typically will cure faster and are available in higher solids for a thicker finish. We suggest asking each contractor for the data sheets so that you can compare the differences in performance. Also ask how many coats are going to be applied and what the total thickness of the flooring will be. This article on how to choose floor coating contractors has more information as well. We have just finished building a automobile dealership and are also in the process of renovating another. The new dealership has an epoxy floor in the service garage and I am already noticing that studded snow tires are cutting through and damaging the new finish. I have been told that a polyspartic floor coating would hold up much better to studded snow tires than the epoxy floor. Is that correct? We have not finished the floor yet in our second project and don’t want to make the same mistake. Both dealerships are in the north east of the US. Hello Rick. Epoxy is common to use as a base color coat since it provides such a thick and hard build. The key, however, it what it is top coated with. Epoxy is rarely the final coat for such circumstances. Yes, a high performance 2-part polyaspartic floor coating will stand up better than epoxy as a final finish. Part of the reason has to do with the fact that it is actually more flexible and less prone to chipping from studs. We recommend that you give ArmorPoxy a call and talk with them. They are a large supplier of concrete coating products in the northeast. They provide product as well as perform installations for many dealerships in your neck of the woods. They can give you the information you need for the correct product based on your needs. I have a two-car garage at my home in the Northeast. As it the entrance to my house most of the time, I am interested in covering the cement flooring to make it look better. No work is completed in the garage…just parking. The concrete has some cracks in it and the garage is partially below the ground level. I have never seen water perculate into the garage from the ground below. The first company I contacted recommended a Floortek surface, which is a polyaspartic material. I was very excited about the look of this until a second opinion company advised against any type of coating due to signs of moisture in the concrete. Instead, they advised a floor tiling system. Again, I have never seen water in my garage that didn’t come from the car tires, but there is cracking. Is this a contraindication to a polyaspartic floor covering? I’m just not crazy about the look of the tiles and would much rather have a truly show-room quality garage floor if possible! Hello Robert. Just because there may be evidence of moisture, it doesn’t mean that there is. We recommend calling the first company back and ask them about moisture testing, what they use for moisture mitigation, and what warranties they have for possible moisture. Tell them what the other company stated. There are special epoxy primer moisture vapor blockers that can be used for concrete that has moisture issues. Cracks in concrete is not a sign of moisture problems. Testing for moisture is not always easy since some slabs will only develop moisture during the wet season. The second company may not have such products and wants to avoid a possible moisture problem by installing tiles instead. While this type of approach avoids issues, it doesn’t deal with a possible solution (if necessary) for the customer either. Before you abandon the coating you want, make sure to talk with a floor coating contractor who deals with potential moisture problems in order to get better information about your options. I have a suspended garage floor with a few cracks where leaking has occurred into the room below. What is the best product to use to insure a good protection from snow and water on the garage floor not seeping down into the room below? Hello Doug. The first requirement is to properly repair the cracks first. Assuming that you want a coating, a single-part polyurea or professionally installed polyurea polyaspartic flooring would be a good choice. These type of coatings have some flex to them which would be desirable for a suspended concrete floor. If a coating is out of the budget, then a good winter containment mat is another option. My garage floor was previously painted. I had a contractor come out who wants to use Sherwin Williams ArmorSeal heavy duty floor coatings – Urethane. Is this as good as Epoxy? He has quoted me about half of what another place is charging for Epoxy. I want to make sure I am doing the right thing. He says he will guarantee it for 5 years. Please advise. Hello Doreen. Does your current floor have paint applied or was it an actual resinous coating? There is a difference. Is this contractor going to remove the paint first? Typically, polyurethane (urethane for short) coatings are applied over epoxy and not directly to bare concrete. It does not bond as well to bare concrete, though Sherwin Williams does have some product that will. Polyurethane is also a very thin coating. A five year warranty would be about right for such a job, though it will not be nearly as long lasting or durable as a properly installed epoxy or polyurea polyaspartic garage floor coating system as you read about here. I am not sure how to tell if paint or resinous coating. Its gray and not shiny and was what contractors put when I bought it 20 years ago. Its probably resinous coating. How can I be sure? One way to tell for sure, Doreen, is to pour a few ounces of acetone out on the floor. Let it sit for a couple of minutes and then scrub it hard with a rag. If the surface softens and bleeds onto the rag, then it’s paint. If all it does is discolor a little bit yet stays hard and intact, then it’s a coating. I am planning to do a two car garage residential located in the Pa. area. We will grind than aid wash, then colored base coat and colored micro chips in a heavy broadcast. Two questions: My garage is insulated and heated (in the wall electric unit with fan). Any concerns with temperature if I check the floor temperature? And after reading your info. I am think of using polyurea-polyaspartic top coating over the epoxy. Is that a good choice? Hi Larry. The polyurea polyaspartic clear top coat is an excellent choice and one that many commercial installers use today. They sometimes refer to that type of system as a hybrid coating. We have an article here about applying coatings in lower temperatures. The most important part is the actual floor temperatures. Some vendors have accelerators or special mixes for epoxy that is being applied in cooler temps as well. Roll ON Rock is an example of that and ArmorPoxy is another company that supplies epoxy for cooler weather. You would need to give them a call. I plan on hiring a company that will do epoxy primer 100% solids, full coverage paint chips and polyaspartic clear coat on top. They plan on using products from FloRock. I’m wondering if it is good system. Their ANSI spex are available on line on their website. Hello Paul. Yes, that is a very good system. FloRock makes great commercial grade materials. I live in the Philadelphia area. Can you suggest a good garage floor company? Hello Anna. We would love to help you out with that, but we don’t have a listing for recommended contractors. However, we do have an article here that can help with choosing a floor coating contractor or company. My contractor is going to finish my garage floor. After sanding the cement floor he will use an epoxy coat and add the plastic flakes completely coating the surface. After that dries he can put either a polyaspartic coating down or a polyurethane coating as a topcoat. He thinks the polyurethane is more resistant to tire staining but will do either for me. He has more recent experience with the polyaspartic but had done both. Cost for me is the same. What is your view on this? Honestly, it depends on the quality of the product, Alan. Like most coatings, there are lower quality and higher quality products of each. What is the percentage of solids for the epoxy he wants to put down? Do you have any brand names and descriptions of the polyurethane and polyurea? Polyurea coatings are thicker than polyurethane. Would he be putting down two coats of polyurethane vs one coat of polyurea? Shea – Thanks for responding. For the top coat, the polyaspartic coating is Sherwin williams General Polymers 4850. one coat. The polyurethane is H&C Pro Series ClearProtect Clear Sealer – one coat. What are your thoughts? Hi Alan. I’m assuming they would be offering the solvent based polyurethane and not the water-based. That said, after reviewing the data sheets the General Polymers 4850 is a much better product. It has a better abrasion resistance rating and provides a single coat that is twice as thick. It will also provide better protection against tire stains though there is never a guarantee that tires won’t stain. The key is to watch for tire marks where you park and don’t let them accumulate over time before attempting to clean them. Lastly, make sure they are using a high solids epoxy and not the low solids H&C epoxy like this one here. Shea – Further to my question on garage floors, the base epoxy being used is General Polymers 3746 High Performance Epoxy. It is 99% solids. Will this be suitable? Thanks in advance. That is a very good epoxy, Alan. The only question we would have would be if your contractor is using an epoxy primer. It’s not mandatory, but most all professional floor coating contractors use an epoxy primer for the following reasons. April 2019 and I have new garage. I am looking for a garage surface that I can hose out, isn’t slip resistant and easy to clean (I have a 73 jeep that leaks too much). Do you recommend epoxy or the more expensive polurea? Based on your article above it doesn’t seem like polyuria is wort the added expense. Hello Charles. If you are going to hire a floor coating contractor, then the main advantage of a commercial quality polyurea polyaspartic garage floor coating is going to be the short one day installation. You also have the advantage of a U.V. stable coating (color will not amber) if you are not opting for full color flake coverage. If you don’t mind waiting a few days, then you can have a multi-coat epoxy system installed that will perform just as well, if not better, for less money. A good epoxy system is going to provide a thicker build and will employ a high performance clear coat such as polyurea, polyaspartic, or polyurethane, depending on the contractor. Either way, an anti-slip additive can be applied to the final clear coat to provide traction in wet environments. Hi Shea. I’d like to get your opinion on which route I should go. I received two estimates for a 1,000 square foot garage. The moisture measured at 3.5 throughout the majority of the floor with one area coming in at 5. The first company said they will shot blast and diamond grind, then do 2 coats of epoxy with color chips in each coat, followed by a clear coat of polyaspartic. All of the joints/saw cuts would be filled so the entire floor is smooth. The cost is $6,000 and they offer a 2 year warranty on parts and labor. The other company would grind the floor, put on a moisture barrier where it was 5, and then use the Penntek polyurea coating with flakes. They would leave the joints/saw cuts. The cost is $7,000 and they offer a 15 year warranty on parts and labor. Which one seems like a better choice? Thanks! Hello Ronnie. Any slab that produces more than 3 lbs of moisture flow per 1000 square feet per 24 hours is a concern when it comes to coatings. Many coatings will not tolerate moisture higher than that for a long period. Is the slab below grade? Have you sourced the moisture issue for a possible solution to reduce it? The second company is obviously addressing the issue with a moisture vapor barrier blocking primer in the area that measured 5 lbs. I looked up the data sheets for their polyurea, but it did not state what the moisture tolerance was for it. I’m assuming it’s greater than 3.5 lbs, but I would ask them first. If so, then that is the company we would recommend. Moisture blocking primers are pricey and explains the higher price point. The first company is not addressing the moisture issue and is most likely counting on it holding past the two year warranty period. It doesn’t make senses to apply color flakes to the first coat and then cover them up with a second coat of epoxy and then flake again either. The slab isn’t below grade. There was only a small area near the 16ft garage door opening that measured at 5lbs. Would applying the moisture blocking primer be a long term solution? If I remember correctly, I believe their polyurea could withstand up to 5lbs. Do you think it’s better to fill in the contraction joints and saw cuts to be a smooth finish or leave the grooves? Thanks for all of the information! Just make sure that water is draining away from that area, Ronnie. Yes, the moisture blocking primer provides for a permanent solution that will not allow the coating to peel from the concrete due to the high moisture content. Filling in contraction joints is mostly for cosmetics. The only functional purpose would be to provide for a smooth surface for toolbox wheels, jacks, creepers, or other rolling objects that might get hung up on wide contraction joints. Saw cut joints don’t create those issues. The only consideration with filling the joints is that you do run a very small risk of the coating cracking over the joints over a period of time if the slab settles.